The Vikings already landed a top free-agent in the 2018 class, but they aren't done adding talent to their roster. Daniel House details the signing of defensive tackle Sheldon Richardson. The Vikings already landed a top free-agent in the 2018 class, but they aren't done adding talent to their roster. This time, Mike Zimmer is getting another talented defensive player. Minnesota has signed Seahawks defensive tackle Sheldon Richardson to a one-year deal, according to Adam Schefter. Richardson visited the Vikings' facility on Thursday and Friday. He will be a key fixture in a defense which requires a dominant, disruptive three-technique defensive tackle. 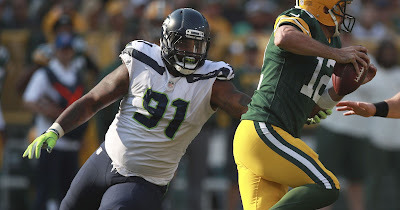 Although Richardson had just one sack last year in Seattle, he tallied 28 hurries, according to Pro Football Focus. When Richardson is at his best, he's lined up as a three-technique defensive tackle. He had eight sacks in 2014 as an integral piece in Rex Ryan's defense. He often lined up in three-technique, but has the flexibility to rush in different positions as well. Richardson has started 70 games, tallying 19 sacks in five years at defensive tackle. He has very light feet and above average athleticism to put offensive lineman on skates. He often wins with a simple bull-rush and flourishes when he is sent off stunts and twists. Richardson is continually improving his hand usage, as you will see in the clip below. It might be one of the best facets of his game at this stage in his career. There is still talent to be garnered with Richardson, but his athleticism makes him an intriguing option in this defense. He is very explosive with his first step and at 300 pounds has the talent to make plays when he's occasionally dropped into coverage. It felt like the Vikings were a dominant three-technique defensive tackle away from taking their defense to another level. Richardson certainly fits the bill. The clips below illustrate a few key aspects of Richardson's game. The Vikings will have one of the most formidable defensive lines in the league with Danielle Hunter, Richardson, Linval Joseph and Everson Griffen all in the stable. Richardson's contract, combined with the splash signing of quarterback Kirk Cousins likely ends the Vikings' free agency pursuits. Now, they can turn their attention to finishing extensions with linebackers Eric Kendricks and Anthony Barr.